I am a member of the Collective Bias® Social Fabric® Community and so Lara and I made this scrumptious healthy Chicken Tikka Masala recipe together as part of a sponsored post and shopper insights study for their client - Flora. I won't repeat the whole of the recipe here but so that you can get an idea of what went into our curry, here is the list of ingredients for our family of 4. To me, cooking a curry with Flora cuisine feels very much like cooking with traditional ghee (but I have no idea where I would buy ghee locally) because Flora Cuisine is very runny and more or less liquid. Usually I would cook the chicken in butter before creating a curry sauce as the buttery flavour and richness really makes a curry - oil never makes a particularly tasty curry. 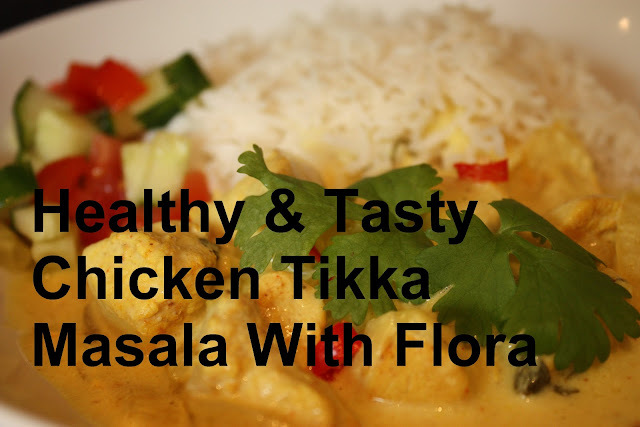 I found the flavour of the curry cooked with Flora Cuisine to be just as satisfying but with 70% less saturated fat than butter (and even 45% less than olive oil) it is a healthier start to the recipe for our family. The chicken was marinated in most of the spices before cooking. We fried it off in the Flora Cuisine together and then fried the onion and turmeric which gives it the vibrant colour (Lara LOVES 'yellow chicken'). We added home-made chicken stock and Elmlea (a low-fat cream alternative) and cooked it all through before garnishing with fresh corriander and slivers of red chilli for the grown-ups. We served our tasty and healthy Chicken Tikka Masala with plain steamed Basmati rice and a chopped cucumber and tomato salad. The curry was very mild and wasn't awfully authentic (I'm sure a chicken tikka masala usually has something to give it a vibrant orange colour) but it was perfect for a family meal as it was very light. I have NEVER seen Holly eat a meal with quite so much enthusiasm... every single atom was consumed. Chicken Tikka Masala - My favourite! This is such a simple chicken curry to cook and all of the ingredients are distinct and easy for young children to identify. Lara and I had great fun shopping for the ingredients together (Lara had to smell all of the herbs until she had found the corriander) and to see both girls enjoying such an english classic curry puts a smile on my face.